Despite the gun battles and rebellious chaos, the cultural scene continued to thrive in St. Petersburg – or as it was known at the time, Petrograd. Renowned theater director Vsevolod Meyerhold symbolically premiered his "Masquerade", based on Mikhail Lermontov's play, in Alexandrinsky Theatre. Contemporaries later shared their accounts of the chaos that ensued. Mikhail Lermontov’s four-act tragedy Masquerade written in 1835, premiered in 1917 in St. Petersburg when the streets were hosting another “tragic masquerade of Russian life.” The Revolution had just kicked off and gunfire filled the air as the country teetered on the edge of a new reality. 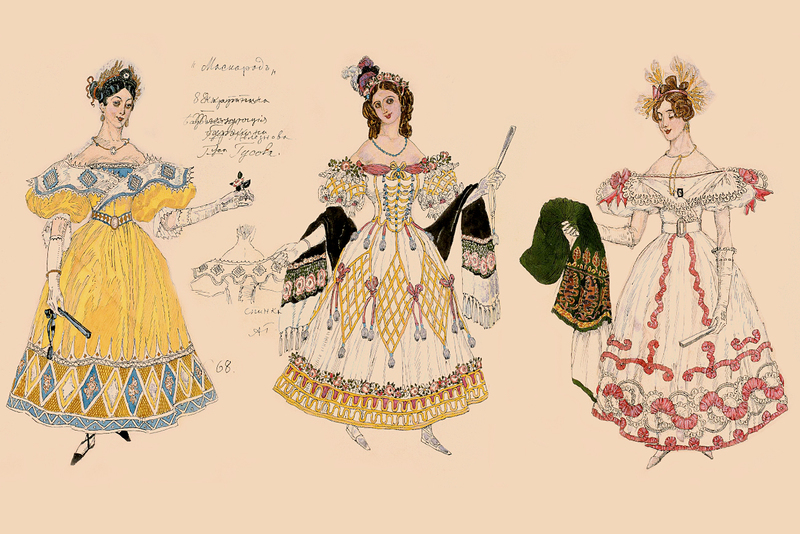 The play tells the following story: Baroness Shtral, wearing a mask, approaches Count Zvezdich at a masquerade, confesses her love to him and gives him, as a memento, a bracelet lost by Nina, another female character. Nina's husband Evgeniy Arbenin recognizes the bracelet and confronts his wife, accusing her of infidelity. Not satisfied with Nina's explanation, Arbenin poisons and kills her. Once the truth comes out, Arbenin goes insane. Masquerade was one of the main productions by Vsevolod Meyerhold, a renowned theatrical director who went on to head Revolution Theater. In 1940, following three weeks of torture, Meyerhold was executed. The legendary performance – under interpretation of director Valery Fokin – will be on stage under the name Masquerade. Remembrances of the Future on Sept. 9 and 10 at Moscow’s Bolshoi Theater, before going to St. Petersburg’s Alexandrinsky Theatre in October. Vsevolod Meyerhold created a special kind of theater that came to succeed folk performances on squares. The theater of the grotesque, as it would later be called, presumed utterly visual, bright and physically complex action.It incorporated both dance and circus routines and cumbersome constructivist designs, which organized the stage space. One of the successful works of him as a director was his futuristic production Mystery-Bouffe, based on Mayakovsky's play of the same name.Meyerhold also developed a system of work with the actors, the so-called "biomechanics", which became one of the strong points in Brecht's dramaturgy. The key element was the physical development of the role. Artists primarily mastered the gestures inherent to the character – it was through the precise movement that psychological similarity of the actor and the character was achieved.